Hydraulic folding wrap holders carry 10 additional rolls. The cradle tucks up under the door to catch the bale. 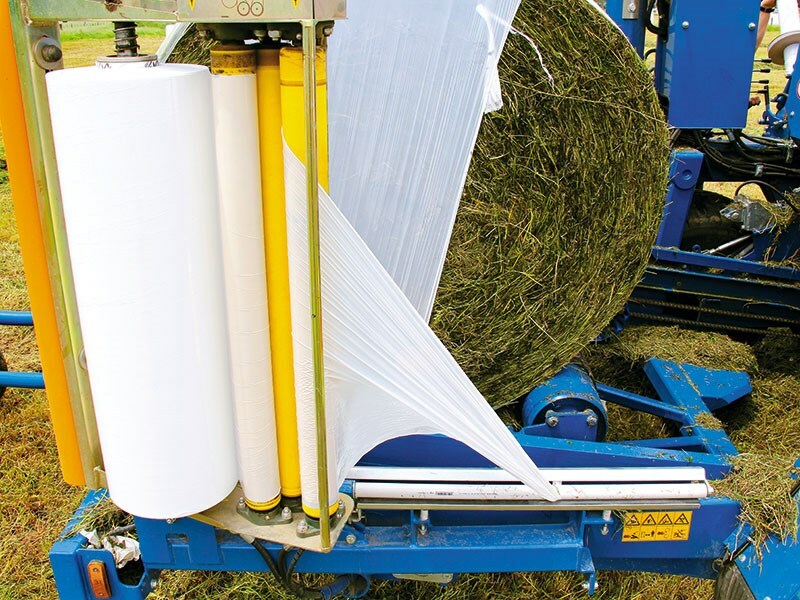 The three roller tensioners on the wrapping heads ensure even, tightly wrapped bales. Manual leavers on the outside allow all functions to be completed without numerous trips into the cab. The binding system allows either film or net to be chosen simply with a button on the monitor. Heavy-duty components help with long-lasting reliability. The plastic tine strippers are almost impossible to break. 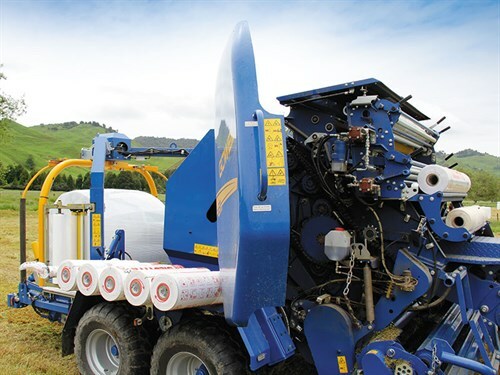 Jaiden Drought takes a peek at a machine new to the New Zealand market that allows you to bale and wrap bales in a timely fashion. 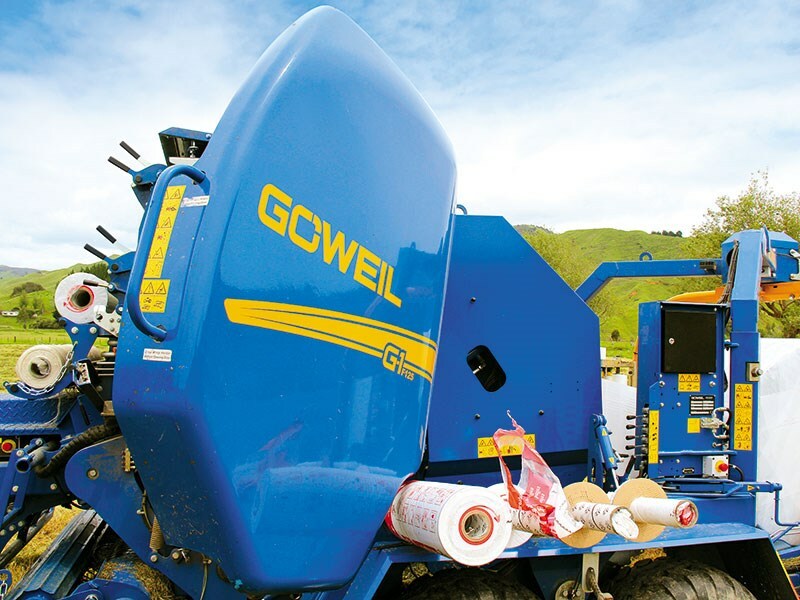 Introducing the Goweil G-1 F125 baler. This test may seem slightly odd as the G-1 F125 baler is a completely fresh machine which is new to the country (and the world), while the functions of the G5040 wrapper, frame and monitor will be very familiar to those who have ever run a baler in a Goweil wrapper frame. This means we have one completely unproven machine coupled to a wrapper and frame which will often outlast three balers. So, how did it perform? Quite well is the short answer. To be fair, the film binding wrap was giving some bother in the 16 micron variety, however the 18 micron and net wrap performed better and I expect 50 bales an hour baled and wrapped in good to heavy crops would not be out of the question. As there is plenty going on with these machines, I'll go through what I perceive to be the standout features. 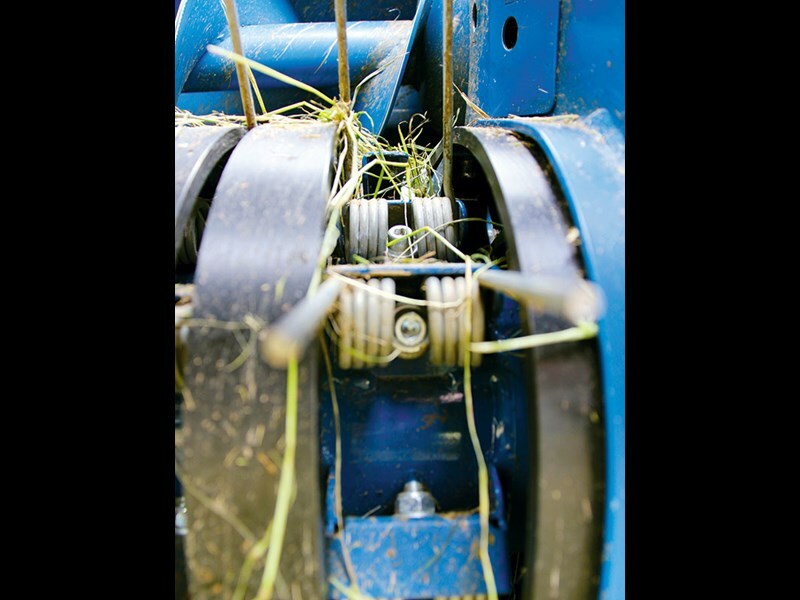 The pickup and the rotor are where the fundamental differences in this baler are compared to many on the market and were of particular interest. 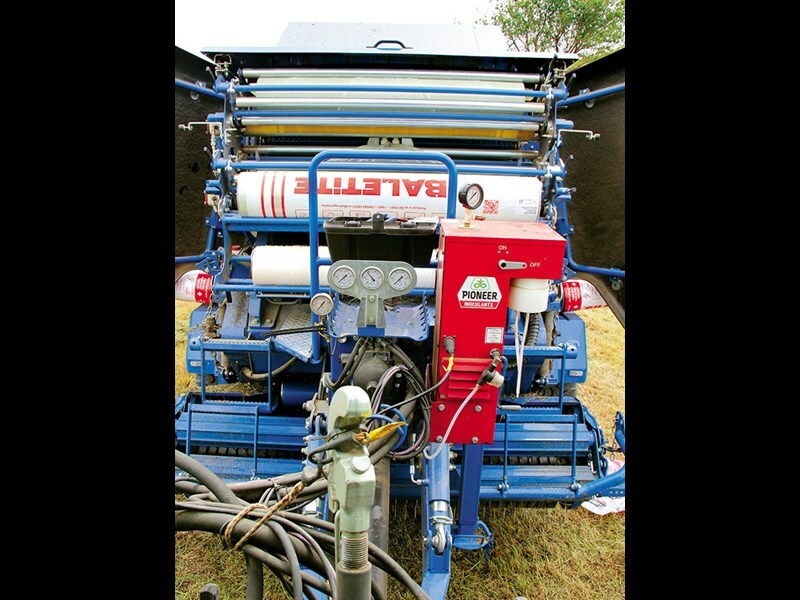 The 2.2-metre pickup has two crop rollers to help smooth the crop and keep wind disturbance at bay while the grass is collected with six rows of tines set at 51mm apart and run in a camless setup. The strippers are plastic and hold their rigidity well, however they will flex if a hard obstacle is hit. The pickup is also set on a pendulum arrangement which means it can manoeuvre 150mm side-to-side as well as up and down. 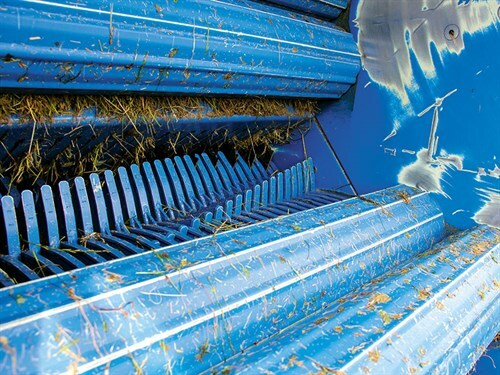 The rotor spins in the opposite direction to most other balers so the crop goes over rather than under, giving the most direct route into the chamber and reducing blockages. Goweil have named this the '8-star Mega Rotor' because of the eight HARDOX points around the large 57cm diameter, giving it a hefty appetite for grass. Rotors are common in balers now though the hydraulic pre compression roller mounted in front of the rotor itself is unique to the Goweil. 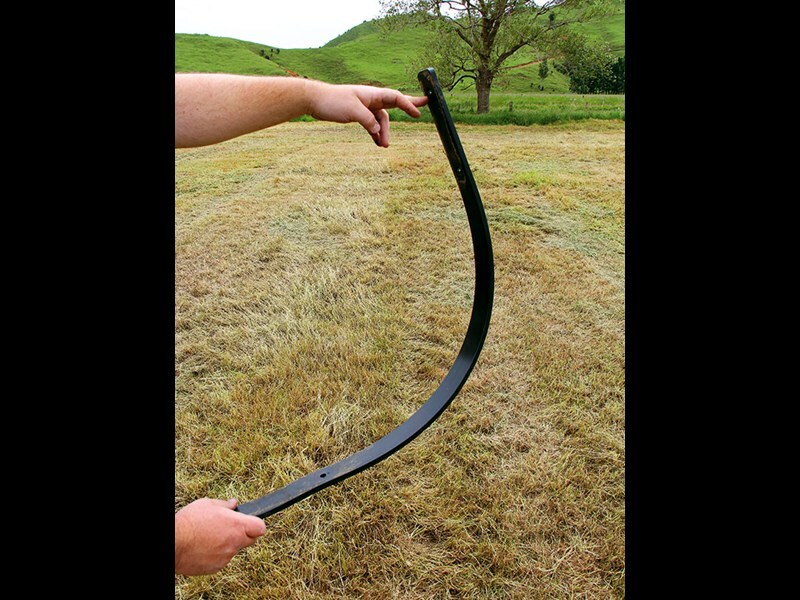 This compresses the material being fed from the pickup makes the rotor both easier to drive and less prone to blockages. ; If you do get a block the Profi program control in the monitor automatically senses the slip clutch has been triggered and lifts the feed roller as well and the drop floor (which lifts instead of drops) and all you have to do is re-engage the PTO and it will automatically do the rest. The cutting unit has the ability to be fitted with 30 twin-blades which can achieve a theoretical 35mm cutting length and also fitted with a hydraulic kick back to protect them against damage should a foreign object come through the rotor. 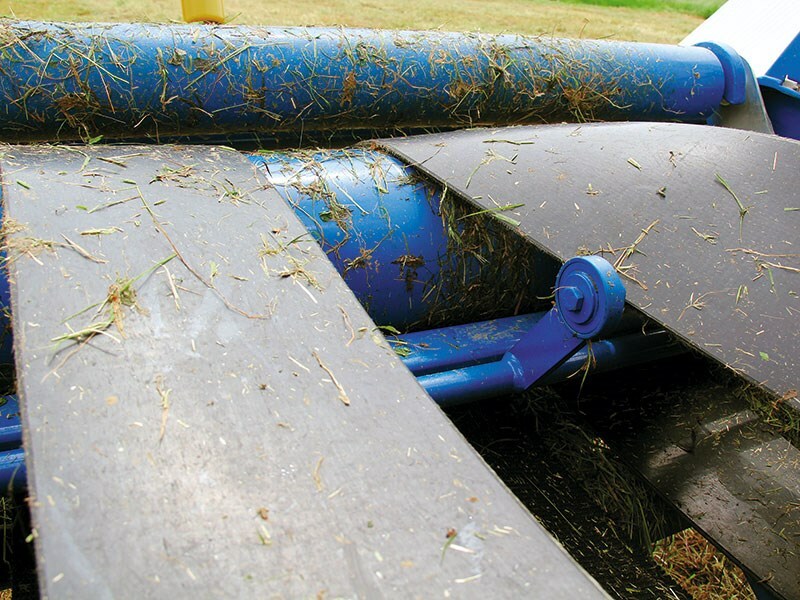 The 1.20-by-1.25-metre chamber is fitted with 18 four-mm thick forming rollers which are reinforced on the inside and ribbed on the outside to give reliable compression, density and rotation of the bale. Film and net can both be carried and switched very easily. The number of layers and stretch can be set from in the cab as the Goweil has a hydraulically adjustable brake roller which ensures that the bale is wrapped tightly during the binding process. The brake pressures and the number of layers can be set directly using the program control. The only downside is the significant size of the binding rollers but you have the ability to change between them at the touch of a button with no spanners required. 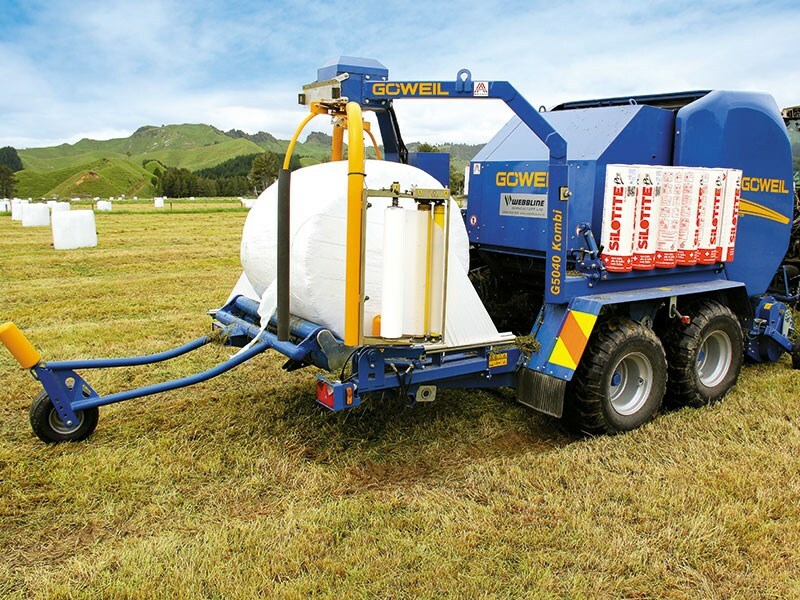 Bales are often done on some marginal land but the balers ability to reliably transfer a bale on a hill is paramount to their success in New Zealand. 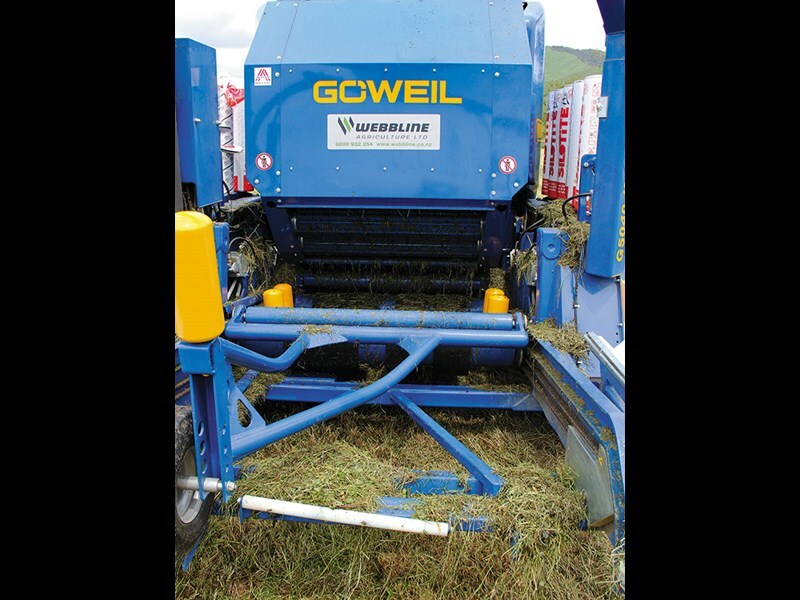 Given the Goweil G5040 wrapper is well proven in the country with a variety of balers, the transfer works very well. The wrapping table moves under the bale chamber as the bale is netting, once on the table it is chain driven to the wrapping position without bale movement. The other benefit I like about this option is the end tipping of bales can be done on the move and the entire day during the test not one fell back over. Many will be familiar with this set-up but in essence, the twin satellite 750mm film arms with three patented rollers ensure even application of the film. 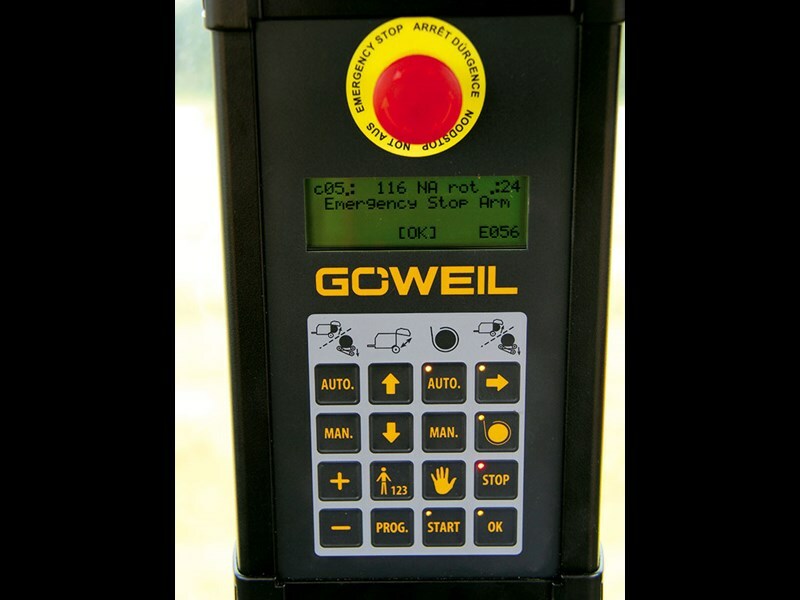 One or two heads can be selected, film break sensors keep the driver aware of what is going on and if one roll runs out before the other it will run in single satellite mode with the table rotations slowing to ensure the 50 percent overlap is maintained. 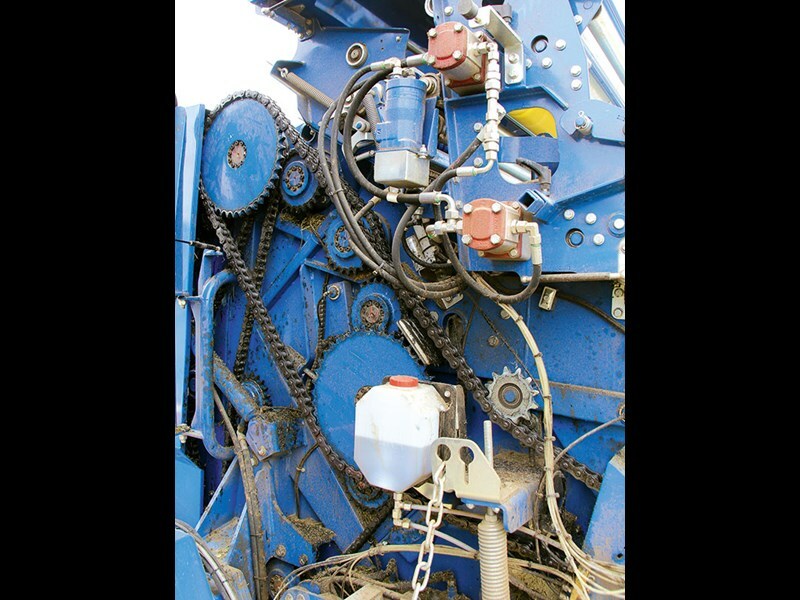 Four belts and four rotating bale guide rollers keep the bale in check even on steep slopes and once wrapping is completed, two knife arms come up and hold the film against the stainless steel cutting knives. I did notice there wasn't really a specific place to tie the wrap onto once you had changed the rolls and had to hold it as you pulled the lever to get the satellite to spin or lift up the cutting arms, which is less than ideal. The hydraulic bank located outside the machine does allow you to move all functions of the baler outside which saves numerous trips back in the cab. One of these levers controls the cool hydraulically folding wrap holders which has enough for 10 additional rolls (five each side) which saves you having to lug the 150 odd kilos back upright. The monitor is user-friendly but basic. It definitely does not fit into the modern world of technology that we live in. A reverse camera can be fitted but in terms of functionality, the combination of the monitor and the lever bank on the side of the machine leave the operator wanting more. Three drawbar options are available, manually adjustable, hydraulically adjustable or hydraulic with suspension. 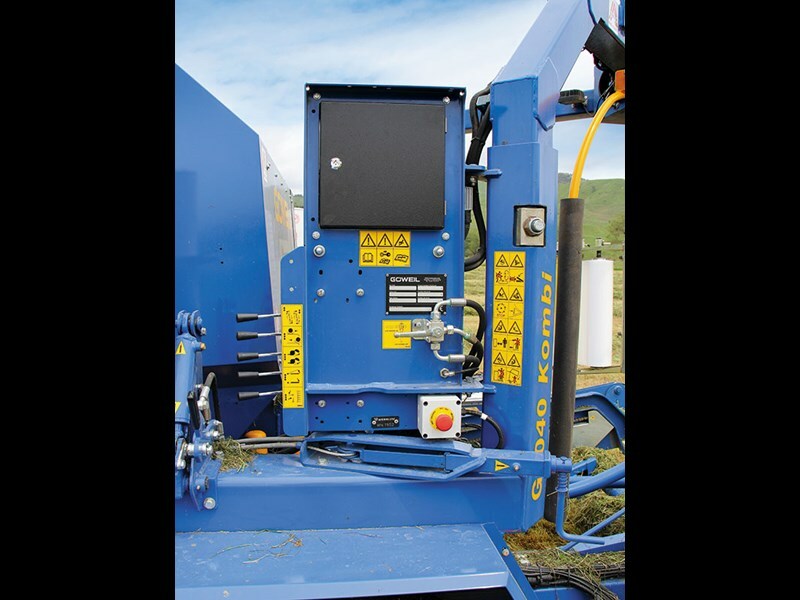 Our test baler had the suspension option which is not only handy on the road but the hydraulic adjustment in conjunction with the pendulum pickup means there is no reason for the pickup not to follow the ground, even in the most testing conditions. The Goweil machines are well known for their afterlife use as bridge building material given their strong construction but given the combi weighs just under eight tonne empty the tandem axle with 500/50-17 tyres used to carry this weight around push the length out to seven metres, both of which will make access trying. There is absolutely no denying this is a good machine. The pickup and feed system in particular will make peoples ears prick up given the often undulating and difficult conditions these machines are expected to work in. The build quality is unquestionable as is the hardware used to make the baler. The twin binding is an excellent feature while the transfer and wrapper are well-proven and reliable. The monitor could do with a little more colour but my main concern is its size and weight, given it is 1.2 metres longer and nearly 1.5 tonne heavier than its nearest rival.